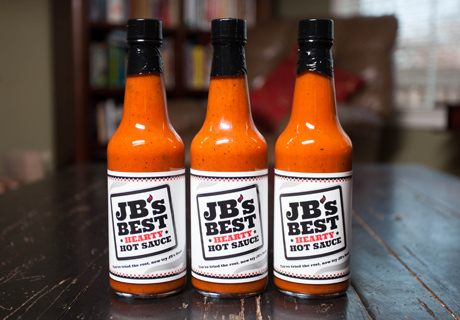 You've tried the rest, now try JB's Best Hearty Hot Sauce! Everyone knows that Buffalo wings were invented in Buffalo, NY, so who else but a son of Buffalo could create the world's best wing hot sauce. Not only was our founder, JB, born and raised in Buffalo, he's perfected the hot sauce that made Buffalo wings famous. But JB's Best Hearty Hot Sauce is great not only on chicken wings; you'll love it on chicken fingers, chicken nuggets, chicken finger salads, hamburgers, hot dogs and anything else you can think of! Please like us on Facebook and follow us on Instagram and Pinterest! You won't believe how easy it is to have JB's Best Hearty Hot Sauce delivered right to your home! FREE SHIPPING! Make your marketing dollars explode with flavor! Ask us how our Private Label Program can help your business! Learn how to make your favorite dishes -- plus loads of new ones -- with JB's Best Hearty Hot Sauce!